Uncategorized | Applied Color Science, inc.
Last Saturday (2/25/17) Radiant Images hosted a camera technology hands-on demo day featuring products from RED Digital Cinema, Zeiss Lenses, and DragonFlyUAS. But it was more than just messing around with new camera hardware. Mike Mansouri, co-founder of Radiant Images, started the day with a panel discussion among industry-leading DPs about how they are using the new tools (4K/8K cameras, VR rigs, and drones) to create compelling content. Cinematographers like Ty Evans, Jim Geduldick, Malik Sayeed, Eve Cohen, Phil Holland, Todd Bell and Michael Muller showed short clips of recent productions ranging from a Beyonce music video to hypnotic aerial photography to dancing with great whites. A common theme that emerged from the discussion was that “mixed reality” is becoming the new foundation for film making – IE – by including elements of standard image capture with the immersive elements of VR and AR, new ways of storytelling are created. Kudos to the team at Radiant Images for setting this up – I’m looking forward to more of this in the future! 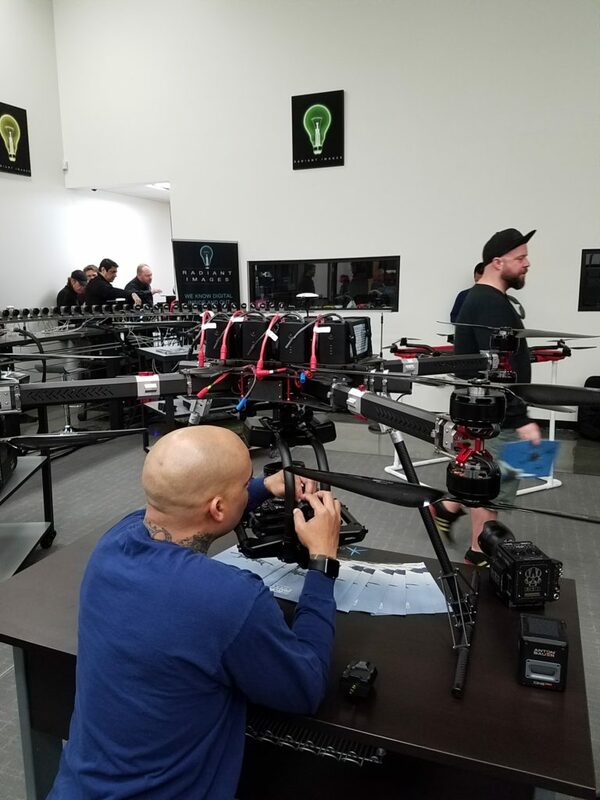 Setting up a DragonFly drone to handle a RED Helium 8K camera and a Zeiss PL-mount lens(lower right). Notice the 4 beefy Anton Bauer batteries. I was told that this unit has a 55 lb. capacity and a flying time of 20 minutes. Nice “bullet time” array of 38 cameras tied together in a NetGear box. Do Consumers Have Camera Fatigue? Looking at a variety of economic indicators, it’s been a rough 6 months for manufacturers of consumer image capture products. GoPro, once the darling of investors, has seen it’s stock valuation drop by close to 90%, largely due to poor sales of it’s latest generation Hero4 camera line. Sales of Apple’s iPhone6, a device that’s more camera than smartphone, have tapered off, causing a ripple effect in Sony’s production of CMOS image sensors. While drones are looking like the next ‘cool’ tech toy, concerns about privacy, safety and government regulation are limiting their market acceptance. 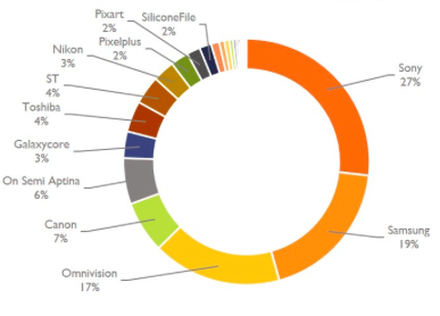 These trends may be an indicator that a majority of consumers are either happy with their current image capture devices and don’t see the need to upgrade, or that the additional features in new cameras (Wide Dynamic Range, low-light capability, etc.) don’t justify their price tag. Or maybe the thrill of being able to share pictures of crazy stunts, stupid pet tricks, or the meal you’re about to have is beginning to wear thin. Whatever the reason, cameras are no longer the techie add-on feature that helps sell smartphones, but instead have become a commodity that is taken for granted – like memory chips. Diversify. (I’m talking to you, GoPro.) It’s not enough to to make a small camera with a fixed focus lens that sells for $400. While the Hero cameras are a good start, they still address a relatively small niche of the photographic universe. Where are the upscale Heros with auto-focus / telephoto / large format lenses? And why can’t iPhone cameras be detachable? Innovate. It’s somewhat ironic that GoPro relies on rolling shutter image sensors from Sony / Aptina-On for sports action cameras. It’s well known that global shutter image sensors are much better at capturing fast motion. Why can’t GoPro take a play from the RED Digital Cinema playbook and make their own proprietary global shutter image sensor? Why can’t Apple do the same? There’s a good reason that Canon is a leader in camera technology. They have owned their own image sensor design for almost 20 years. Communicate. Now that we have entered the era of computational photography and the Internet of Things, it’s time for cameras to talk to each other, and not just for gen-locking. Imagine the possibilities if every iPhone/ Hero at a public event shared images to the cloud to create a massive VR image of the event from multiple points of view? I, for one, see the current market situation for cameras as a relatively minor bump in the road on the way to a very exciting future for imaging and photography. I’d love to hear from others who may agree or not. Applied Color Science is pleased to announce the development of VisceRal – a camera electronics/software platform designed specifically for Virtual Reality (VR) applications. Drawing on it’s expertise in 3D and HD video camera design, ACSi has developed a system that supports simultaneous operation of up to 9 image sensors with absolute gen-locking from a common clock generator. Additional details are available here: Visceral_camera_onesheet. Hackable Cameras – Good or Bad? Now that cameras have become software-based image capture devices, they share a characteristic with many products in the digital age – the ability to be hacked. In fact, a regular cottage industry has arisen around reverse engineering commercially released cameras and figuring out how to enable additional features or disable unwanted features. Some notable examples of this are CHDK and Magic Lantern for Canon Point-ans-Shoot and DSRs, respectively, and MewPro for GoPro Hero3 cameras. The down side is that you probably void the camera’s warranty in using these hacks and open up the possibility of putting the camera in a mode that either fries the electronics or damages the optics. Anyone interested in developing the next ‘must-have’ camera for Cinema/Broadcasting should consult this chart from Clairmont. Find out more about this ‘disruptive’ technology here. Matt Whalen of Applied Color Science has just published a white paper discussing how advances in image sensors, lens technology and image processing are converging to eliminate the need for large expensive lenses in digital photography. To read this, click here. embedded IP block as the newest component in it’s library of ISP(Image Signal Processing) IP. tool for cinematographers and digital photographers worldwide”, said Matt Whalen, president and founder of ACSi. – Support for 17X17X17 and 33X33X33 LUTs.